I lived for 13 years in Belgium and a very happy 13 years they were. It’s easy to get around, it’s got urban, rural, all the major bands play there, it’s got loads going on, you’re near stuff elsewhere – day trips shopping in Lille, or going to stadium gigs in France, Christmas market in Aachen. Yes there are internal tensions, but that’s not unique – there doesn’t seem to me to be much love lost between north and south England sometimes, and I’m sure some French people would love the idea of getting shot of Paris! Most countries of continental Europe have existed in some other form in the past – why single Belgium out as a non-country on that basis? Various things do unite Belgians, and perhaps most importantly, distinguish them from their neighbours in France and the Netherlands. For example, try getting a meal in a restaurant in the Netherlands after 9.30 pm: in all parts of Belgium kitchens are often open past midnight and they do enjoy their food and leisure in a very non-Northern European way. You can even eat the kebabs when you’re sober…! There’s the old chestnut that there are no famous Belgians. A very trendy restaurant in central Brussels has a wall covered with the names of famous Belgians, which makes you realise that the problem is most people think the famous Belgians are from somewhere else. Even if we discount the many famous Flemish School painters, on the basis that Belgium didn’t exist as a separate nation then, the Belga Queen will tell you that the famously French Johnny Hallyday is Belgian. If you’re not familiar with him, you have to watch his performance of Amsterdam, I’ve watched this loads, heard the song hundreds of times, but it still give me goosebumps. In among concerns all the heavy stories we have to deal with – eurozone, Lisbon Treaty, MEP’s outbursts – there is sometimes light relief. 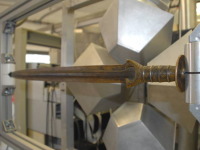 See today’s story coming from the Joint Research Centre (declaration of interest – I used to be their Spokesperson) on using neutron beams to learn more about a Bronze Age sword. Just signed up for, and created my first, Audioboo. Not a piece of fine intellectual work, obviously, but just giving it a go. Not quite sure how it will work, though maybe sometimes having the possibility to leave a voice message for the world (as opposed to the text message to the world that is twitter) will be useful. We’ll see… Can you integrate it with WordPress? I suppose if I were visiting something interesting and was out and about, it might be good to record my thoughts, rather than waiting till I was back at my desk to write about it (and not getting round to doing so). An example of that would be last Sunday’s Manel gig which was immense fun (and brought Barcelona to Shoreditch, if only for the night) but had been washed away by the joys of commuting before I got to my desk on Monday! I got up at 6.30 this morning, as I wanted to register at 8.15 for the conference that a Commissioner was speaking at today, to get it out of the way. I was on the train by 7.30 (if there’s one thing I miss about Brussels, it’s the short commute!) and then got a call from the Commissioner’s staff that they needed a car. So I headed to the hotel instead and sorted that out. We got to the conference venue, and once everything was sorted there, I headed back to the office. Time for a quick flick through the day’s press review (usually done on the train, but no time today), took part in the daily briefing from Brussels, then finalised the organisation of the team now that we’ve lost one of our staff. I headed back over to the conference venue at 10.40 or so to find the camera team that would be interviewing the Commissioner at 11. It’s easy for people to find me when I’m wearing the leopardskin coat…! We realised that it was going to be far too noisy in the street so we headed back to the office to do it there. I had reckoned without the building works next door which can be heard everywhere in our office, so we scoured the building for the quietest room that we could bear to be filmed. While one of the team tried to stop the jackhammers for the 10 minutes we needed, I waited outside the conference for the Commissioner – of course it ran over time. One of the most difficult things is always getting the person to do the interview out of the full conference hall where everyone wants to say hello, congratulate him on his contribution, give him their card, ask him to speak at their event… then past the journalists that are waiting for a “quick comment” and off to the interview. The AV interview went pretty well and then it was into an hour with a national newspaper. My role in the interview is different to how it was when I was a spokesperson as I’m not as familiar with the content, so it’s just a question of making sure it finishes on time. Once out of the interview, got the Commissioner and staff back to where they needed to be and made sure the journalist had everything needed. Then I had to work out how to get the luggage into the car that will be taking them to the airport, which is going to entail me carrying it over to the venue in about 30 minutes. Time for a quick bite to eat, then back to my desk to deal with the e-mails that have come in during the morning, prepare for several meetings and try to pin down arrangements for next week, when another Commissioner is in town…and we get to start all over again! It’s time for round 3 of the think about it blogging competition, which this time is on development issues, something close to my heart, giving my years living in developing countries and working in that area at one point in my Commission career. Anyway, I think the competition is quite interesting, as it seems to be at the core of the burgeoning Euroblogosphere, which, while pretty small, is (arguably) mch more identifiable than any sort of European press. So, give it a go! Well I never! Glamour magazine, from the Condé Nast stable and aimed at the fashion-concious young woman has a piece this month on “The EU in 60 seconds”. Quotes the European Movement, UKIP and Maurice Fraser of the LSE, which seems to cover all the bases. Great stuff! The EP approved the Barroso II Commission today, so we get started tomorrow. Glad the inter-regnum is over and we can get on with getting on with things! So, I’ve made a decision to change the approach to Twitter. As you may have noticed, I’m a big fan. I love the interaction with people, the information and intelligence and having a lovely helpful network at your fingertips (literally) to help you out, whether it’s with a treaty article or a good restaurant in Rome. On the other hand, I’ve been blogging under the reps name, but with a lot of my own interests in there (London life, web 2.0). So I think I’ve decided to change the name of my account to match this blog. That way it’ll be clear that it’s me tweeting, albeit retaining the link with my professional capacity. And then I will leave EUlondonrep for the original purpose, which was a resource for all the office to use, whether from the media section, schools, regions, networks, political etc. I’d really appreciate some input from the Twitter crew – is this a good idea?